· Four plywood sheets, 8'x18"x3/4". These can be cut from two standard 4'x8'x3/4" sheets. Oak or birch is recommended. · Two plywood sheets, 8'x12"x3/4". For inserts. These are left over when the above sheets are cut. · One 8' 2x4, high quality, straight. For wall mount. · One 1"x2"x8' oak (for trim along back of bench). · 3/4"x3" oak facing (for bench). Ten feet total length. · 3/4"x1 1/2" oak facing (for inserts). Eight feet, approximately, depending on number of inserts. · Three 1 1/2-inch steel pipe (38 inches approximately, depending on desired height, threaded at both ends). · Six 1 1/2-inch pipe flanges. · Lag bolts (for 2x4 wall mount). Wood screws--assorted lengths (for fastening layers together, fastening bottom layer to 2x4, attaching leg flanges to bench and floor, fastening trim strip along rear of bench and attaching oak facing). At first glance the dimensions seem odd. Only 18 inches deep? In fact, that is more than sufficient for actual loading operations. Making the bench deeper only invites using it as a storage area--not a good idea since that might lead to mixing up powders or primers. 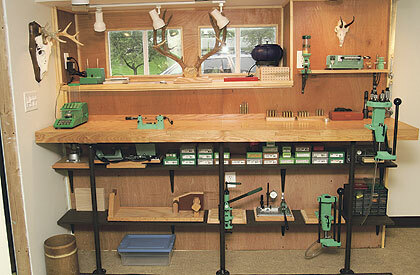 Store the components elsewhere, and move them to the bench only when needed. Its width also discourages use as a general work bench.